Creative, a worldwide leader in digital entertainment products, today introduced the Creative Xdock Wireless, which docks an iPod and plays music in Xtreme Fidelity - music beyond CD quality - via Creative X-Fi Wireless Receivers in any room in the home. The Creative Xdock Wireless also connects directly to a powered speaker system or home theater system to play video, photos and music in DTS surround-sound. The Creative Xdock Wireless is designed to work seamlessly with the iPod and has been certified by Apple under the Made for iPod programme. -It plays music through multiple Creative X-Fi Wireless Receivers in different rooms of the home connected to powered speakers or a home theater system. 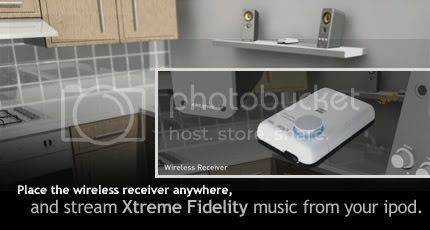 -It plays music in Xtreme Fidelity - music beyond CD quality. -A line-out for connection to powered speakers, which also functions as an optical-out to your home theater for DTS surround-sound. -S-video and composite video-out connections, so digital photos and videos stored on an iPod can be displayed on a TV screen. 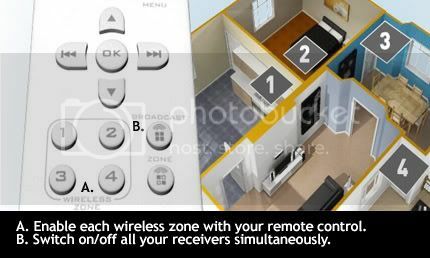 -A wireless remote to navigate the iPod menu, adjust volume levels, and activate X-Fi Crystalizer and X-Fi CMSS-3D. -It docks and charges an iPod and includes line-in for connection of other audio devices. Also avaliable soon is the Xmod Wireless for Creative's ZEN series of MP3 player.